Product categories of POE Switch 16 Ports, we are specialized manufacturers from China, POE Switch 16 Ports, Managed POE Switch 16 Ports suppliers/factory, wholesale high-quality products of POE Switch 16 Ports For Cctv R & D and manufacturing, we have the perfect after-sales service and technical support. Look forward to your cooperation! 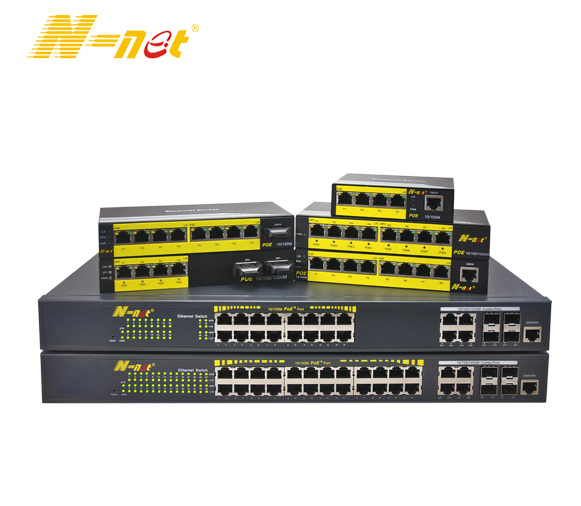 N-net 16 Ports POE Switch series includes the fast Ethernet series and gigabit series, also the managed and unmanaged series. It supports 16 ports PoE ports with up to 30W PoE output per port and total power budget 300W(Built-in power supply). PoE is especially suitable for devices that are far from power outlets or when users want to minimize the clutter of extra cables as power is supplied via the Ethernet cables themselves. This series enables users to easily connect and supply power to PoE-capable devices such as wireless Access Points (APs), IP cameras, and IP phones. It can also connect other Ethernet devices like computers, printers, and Network Attached Storage (NAS) to fit into any type of network application. 4 Combo uplink ports means businesses can increase their network bandwidth via wired speed while offering redundancy so voice and surveillance data are transferred reliably. The combo design can increase bandwidth by offering two Gigabit copper or fiber connections, giving administrators more options for expansion.